Silk Laundry is a carefully curated line of silk essentials. Silk Laundry items are so comfortable and versatile they’ve rapidly become a wardrobe staple for women around the world. Silk Laundry uses Okendo to enable past customers to share their product insights and experiences with future shoppers. In doing so, they increase both sales and brand loyalty by elevating shoppers' pre-purchase confidence and excitement. Read on to see how they do it. Founder, Katie Kolondinski needed a platform which would leverage the insights and positive brand experiences of her existing customer base. These insights would be crucial to communicating the Silk Laundry ownership experiences and in building trust among shoppers in new markets. “From our early days, we’ve been blessed to have a local customer base who felt a strong connection with our products and brand values. As we began to grow the business and compete in international fashion markets, we wanted to effectively harness the value of these relationships to support our growth. We wanted a way our customers could share their positive product ownership experiences with shoppers in foreign markets who may not have ever heard about Silk Laundry before." The meaningful insights in the Shopper Profile can be utilised by future shoppers as a genuinely useful decision making tool, helping them to identify past customers with personal preferences and sizing requirements similar to their own. Customers could also provide insights into the dimensions of Silk Laundry items which appealed to them most, such as the 'Quality' and 'Design'. These insights helped shoppers unfamiliar with the brand to gain an insight into product ownership and in doing so, better appreciate Silk Laundry’s unique selling points. Further, as shoppers were able to make more informed purchase decisions Silk Laundry saw a noticeable decrease in product returns and increased customer satisfaction. 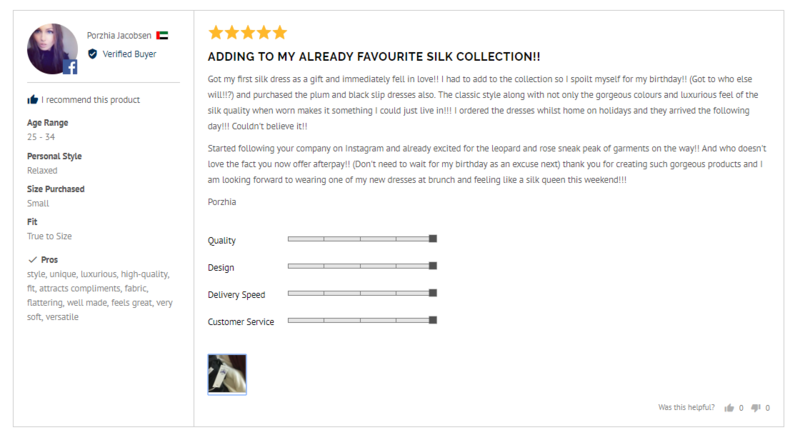 Although previously using YotPo to capture customer reviews, the reviews Silk Laundry were generating were primarily one or two lines of basic text. By switching to Okendo, Silk Laundry were able to invite all past customers to share in-depth feedback about their product and brand experiences. 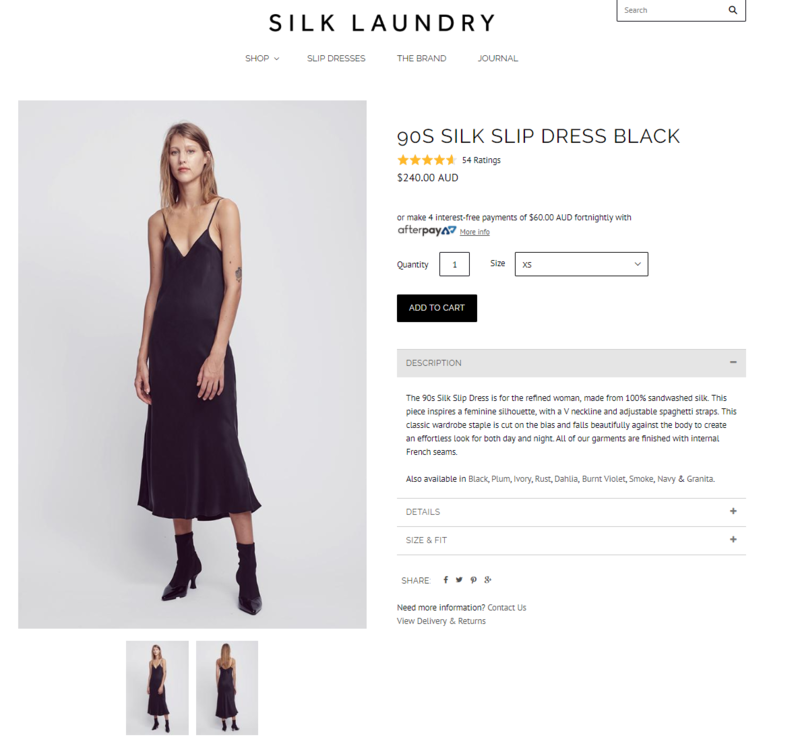 For products purchased, customers were able to identify what size they purchased, their body type, personal style and an insight into how the Silk Laundry item fitted them personally. "Since switching to Okendo we've noticed a big increase in not only the amount of reviews we have received, but also the quality and information in them. The Okendo system allows our customers to add personalised information to their reviews leading to greater trust within the Silk Laundry brand.